To make a vast majority of the jewelry on this website, you will really only need a few basic tools such as Jewelry Pliers: round nose pliers, flat nose pliers (also known as chain nose pliers), crimping pliers, and some flush cutters. You can pick up a basic set of beading tools at your local bead store or craft shop, or you can find them on-line at eBay or any number of bead stores. Of course if you're a serious jewelry making hobbyist (or a professional! ), there are a whole slew of other jewelry tools you might eventually want to pick up, and these tools will become important if you plan to make a lot of jewelry or if you plan to specialize in making a certain type of jewelry. For example, there are tools that assist in knotting if you plan to make stringed jewelry such as strands of pearls. 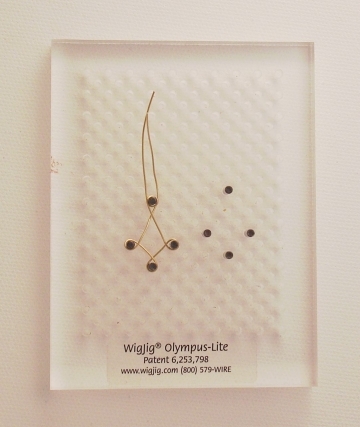 There are specialized tools that assist in jewelry wire wrapping , such as a wig jig tool that helps make consistent wire loop designs, and nylon jaw pliers that won't make marks on the wire. There are additional pliers such as split ring pliers , used to open split rings so you can easily attach them onto your chain (such as for attaching charms to a charm bracelet). 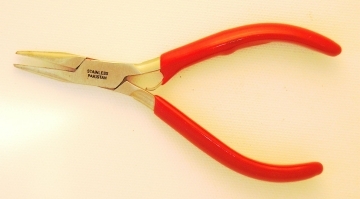 And if you plan to use memory wire, you will need special memory wire shears that are hard enough to cut the wire without damaging the blade of your normal wire cutters. Also, just like with any other tool, jewelry tools come in a variety of price ranges depending on quality. If you are a beginning jewelry maker, just start with a basic inexpensive jewelry tool set. If you find you are making a lot of jewelry, or you plan to run a jewelry business, you will want to invest in some top quality tools that will last a lifetime. Some high end jewelry tools also have ergonomically designed features that can help prevent excessive hand and wrist strain. Other things to consider adding to your jewelry making arsenal will include a well-lit workspace, so you might consider purchasing a bright craft light (like an "Ott" light) or "daylight" lamp. This will ensure you are seeing the true colors of your design, as well as reduce eyestrain. You might consider a magnifying lamp or magnifying glass if you will be doing a lot of fine detailed work, as this will really reduce eye strain and make your work easier. You'll want to set yourself up so it isn't a pain in the neck (literally!) to make jewelry. Get a comfortable chair, and make sure you have a table that is high enough so you can easily work with your jewelry. If you need to, pick up magnifying lenses (some of the craft lamps have them built into the hood) or wear glasses if you need them. This is tiny, detailed work and you don't want to strain your eyes. Again, if you suffer from joint pain or arthritis, it might make sense for you to invest in the more expensive tools with comfort features. It is important that you are comfortable and not hunched up while making jewelry, so spend a little time making sure your jewelry workstation is set up for optimum ease of use. 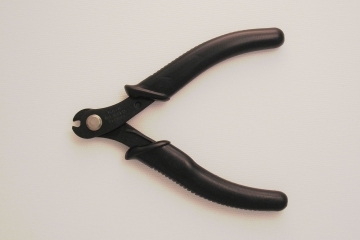 These round nose pliers have round noses or tips, and are used for creating wire loops. 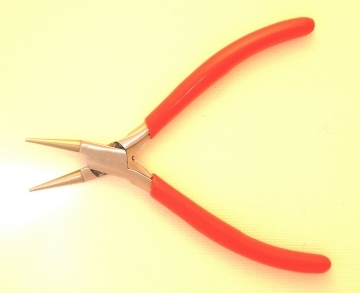 All wire wrap jewelry will use these pliers. The size of the loop depends on how far down the plier tips you grasp the wire. Flat nose pliers, also known as chain nose pliers , are smooth and flat on the inside. These come in very handy for holding jewelry, pulling wire tight, or especially if you are wire wrapping jewelry to grip the wire and hold onto one end. You can also use them to fold over the wire to make a right angle, and to basically grip anything that is difficult to do with your fingers! You will use these pliers all of the time! Needle nose pliers are the same as flat nose pliers, and they just have a longer "nose". If you plan to use crimping beads, then these crimping pliers will help you achieve a consistent smooth and finished look on your crimps. 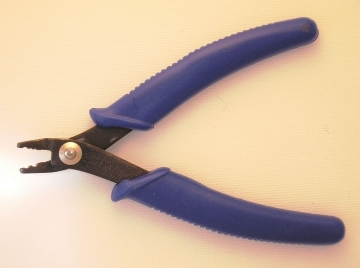 You do not absolutely have to have them--you can close crimps simply by smooshing them flat and closed with regular pliers, however once you have tried these crimping pliers you will never go back. They just look and feel that much better. 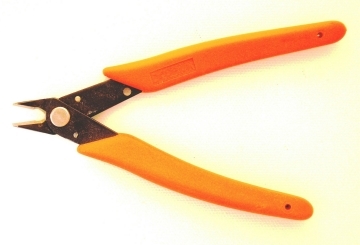 Wire cutters, also called flush cutters , are used to cut the stringing wire, as well as wire used in your wire wrapped jewelry designs. Invest in some good quality snips if you plan to make a lot of jewelry. Never use your regular wire cutters for cutting memory wire. Memory wire is hardened and you will nick your cutters if you try to cut memory wire. You need special memory wire shears specifically for working with memory wire. You know those little rings that look like miniature key rings? These are split rings and they work the same way as a key ring--you separate one end and slide your split ring onto whatever you are trying to attach it to. You know how hard it is to put keys on your key-ring without it slipping off or breaking a nail? Well, let me tell you--working with miniature little split rings is even worse! These split ring pliers will separate the ends of the tiny wire so you can slip them onto your component without tearing all your hair out in frustration! If you plan to attach a lot of pre-bought charms with split rings, you really might want to invest in a pair of these. Memory wire jewelry is great because it is so simple to make. Simple, as long as you have memory wire shears to cut it! These are a must-have if you plan to make memory wire jewelry. They are extra durable and especially made to cut hardened memory wire. If you plan to work with a lot of jewelry wire, these smooth nylon jaw pliers are great for pulling coiled wire flat, and for holding wire without putting marks or dings in it. I can't tell you how many times I have gone to make a beaded bracelet or necklace, only to discover that the diameter of the bead holes on my beads are not large enough to accommodate my stringing material. Argh! When this happens to you, it's a bead reamer to the rescue! Simply use the diamond-dust coated reamer tip to drill the hole until it is large enough. Be careful though, some beads will simply crack with too much pressure. A lot of semi precious gemstone beads as well as pearls come with very fine drill holes. It is usually better to just start with a fine diameter/gauge of stringing material and avoid having to drill holes altogether. Still--a handy tool to have around! A jewelry awl is like a needle on a stick. It allows you to position beads and hold thread while pulling knots tight, used especially for stringing pearls and other knot-work. It's also handy if you need to untie a knot. Tweezers work the same way. A ruler comes in very handy for measuring bracelets, etc., especially if you aren't using a bead design board. I use a nice 18 inch stainless steel ruler, myself. A jewelry design board, or bead board , is a very handy and inexpensive item to have for beadwork. 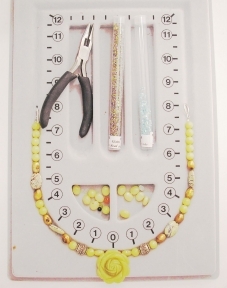 If you will be making necklaces, this is a great way to lay out designs so beads don't roll away. You can experiment with bead placement and you can easily see the length of your finished piece. Or, get a beading table mat or cloth. You can buy one, or it use any piece of fabric that works for you, preferably a fabric with some “nap” to it, which keeps beads from sliding off the table. A bead mat is simply any fabric or mat that has some texture to it, so the beads don't all escape and roll away off your table. I bought myself one of these and it was made from a plush felt-like fabric much like a Vellux blanket. If you can afford to, purchase a craft lamp that provides bright natural spectrum light. While this is not completely necessary, they are great for seeing the “true” color of your designs and also for reducing eyestrain. A highly recommended brand of craft light is the Ott light, but any bright natural bulb should work if you can't afford to splurge on a specialty lamp. Sunlight, of course, is always a great alternative if you have a window where you can place your jewelry table. 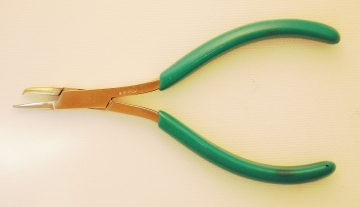 Thread scissors are small scissors designed for cutting thread. 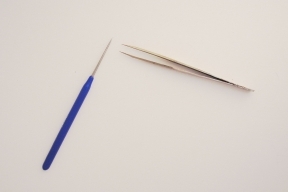 They have nice small sharp tips and are easier to use on fine thread than your normal larger scissors. 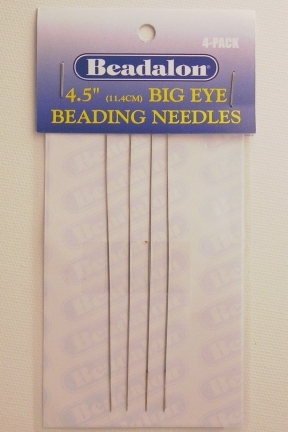 Beading needles are special needles with an eye that will collapse so you can pull it through the beading hole. 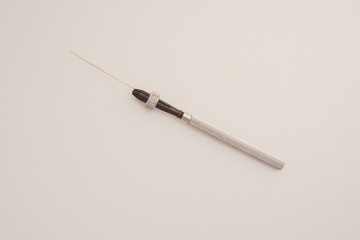 This is a long skinny needle with a broad opening in the middle that opens for easy threading. Thread conditioner (also try beeswax) is sold under several brand names and is used with silk cord and thread. It conditions the thread so it doesn't fray and it also makes it easier to handle. Silver polishing cloths can be used to remove tarnish from silver jewelry. Silver cleaner is usually sold as a dip and you can easily clean your silver jewelry this way. Anti tarnish strips can be placed in storage or in the box with your components to prevent tarnish from forming over time. If you plan to make your own polymer clay beads, some additional tools will come in handy. You can buy a set of polymer clay jewelry tools wherever polymer or modeling clay is sold. These kits usually have a plastic roller, a cutting blade or tool and potentially some mold forms. You will also need something to bake and cure the clay. Due to the potentially noxious fumes that are created while the clay bakes, you never want to use your home oven for this unless you are prepared to thoroughly clean the oven after each use. It isn't recommended, especially because you can just use a cheap toaster over and not have to worry about it! 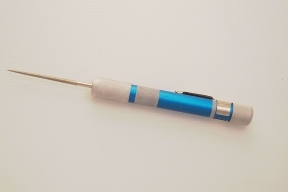 If you want to work with silver metal clay, you will want similar tools to polymer clay. Basically you will want to roll your clay out with a roller, cut it using any x-acto knife or cutting tool, fire it using either a jeweler's torch with stand, a kiln, or a specially made PMC Hot Pot, and then you will need to finish your piece by polishing it. If desired, you can also dip your piece in oxidizer if you want to fill in gaps with a blackened finish. Additional tools you might want for working with metal clay include specialized texturing plates, and if you want to make rings, a set of ring forms especially made for working with metal clay, or a ring mandrel will come in handy. Metalsmithing is fun and very rewarding. I'll never forget the first time I soldered something (or the second time because the first time it didn't stick...) or the time I created my very first sterling silver ring completely designed from scratch! We won't go into metalsmithing too much on this site beyond the basics, but if you plan to take up advanced jewelry design in the form of metalsmithing, you will need at least a starter set of metalsmithing tools. When setting up your metalsmithing shop, expect to spend anywhere from $100 - 1000 on tools and supplies, depending on how extensive a set-up you need. These tools include: jeweler's saw and blades,jeweler's torch (in a ventilated area! ), a firing stand or tripod, copper tongs, tweezers, acid bath (generally a crock pot specifically dedicated to this purpose will work fine), files and sandpapers of varying grades for polishing, a jeweler's hammer set and rawhide mallet, and depending on what you plan to make you may want ring, bracelet or necklace mandrels for forming the metal. You will also need a shop table with vices so you can attach your piece and hold it down while you are working on it. Start Your Own Home Jewelry Party Business Today!